In 2003, Honda released the first Honda Civic Hybrid in the United States. Over the last 12 years, the 2015 Honda Civic Hybrid has managed to incorporate even more breakthrough technology that allows the Civic Hybrid to lead the pack in fuel economy and overall efficiency. 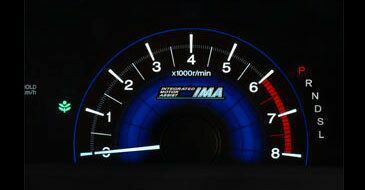 The industry standard is continuously being raised by Honda. The 2015 Honda Civic Hybrid easily achieves an EPA-estimated fuel economy rating of 44 miles per gallon in the city, and an incredible 47 miles per gallon on the highway. As an IIHS Top Safety Pick, a Kelley Blue Book Best Buy Award winner, and one of the highest-rated hybrids ever ranked by Consumer Reports, car buyers need not choose between safety, overall value, or performance. It's all here. The four-door, 5-seater checks all the boxes when it comes to combining a surprisingly roomy interior with a dynamically-styled exterior into one compact hybrid sedan. Go farther and save more with the 2015 Honda Civic Hybrid. 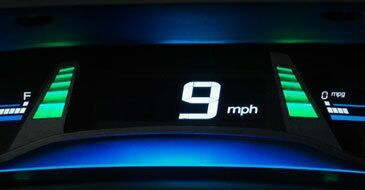 On either side of the speedometer are illuminated bars that change from blue to green to indicate how efficiently the driver is operating the car. 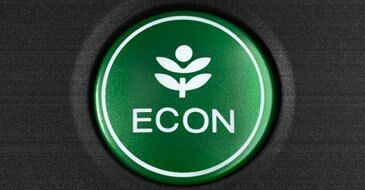 For added efficiency, drivers can choose to push the ECON button to automatically adjust fuel-consuming systems to maximize fuel efficiency. The Honda Civic Hybrid blends power and efficiency by integrating a 1.5-liter, 4-cylinder gasoline engine with a high-performance electric motor, seamlessly transitioning to offer consistent and efficient power.